You´ve done training – now you have to run the race. Here are our top ten tips to help you succeed in any big city marathon. Be determined to finish. Your mind needs to be as strong as your body! Don´t give up unless you have an injury. Check all your gear carefully three or four days before the race. Then you´ll know you haven´t forgotten anything. Don´t wear any new gear, especially shoes. Have a gentle run the day before the big race. 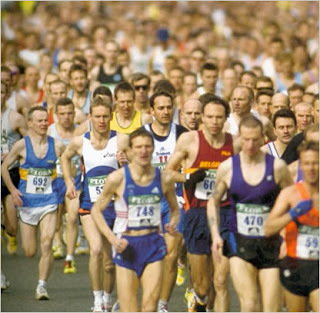 Two or three miles will not affect your energy reserves and it will relive any pre-race nerves you may be feeling. Resist the temptation to spend the whole day before the race sigthseeing or shopping. It is easy to do that at the big city marathons like London or New York, especially if you go with a partner. Take it easy the day before. Have a shower the morning of the marathon. This removes body oils and helps the body stay cool, which is important to prevent dehydration. Split the race into ´chunks´ in your mind. Concentrate on each five-mile or five-kilometre section, so that you feel you are making progress. Instead of running 26 miles you just have to run five miles five times!. Run at a steady pace that you know you can maintain. Don´t get too excited at the start – if you set off to fast, you´ll suffer later. Eat a large balanced dinner in preparation for the race. This could include protein, carbohydrate, and some fat. A nice dessert would be fine. No alcohol! Don´t drink too much during the race. You should sip water at every stop but not too much. Never try glucose supplements if you haven´t used them before in trainning. Plan how to get to the start of the race carefully and arrive at least half an hour before so you have time to warm up properly.